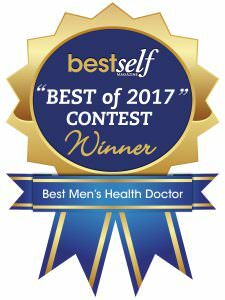 Scott D. Miller, MD, was recognized in Best Self Atlanta Magazine’s “Best of 2017” as the “Best Men’s Health Doctor.” Magazine readers vote to determine the winners of the “Best of 2017” contest. Dr. Miller was cited in the magazine as an advocate for minimally invasive procedures and devoting most of his practice to laparoscopic and robotic surgery. As of January 15, Dr. Miller’s practice is based in Roswell at WellStar North Fulton Hospital. “I am excited to receive this honor from Best Self Atlanta, and it is especially meaningful since the award is determined by votes of readers,” Dr. Miller said. “My practice has always been guided by one consistent philosophy: focus solely on patients’ special needs and perfect the techniques necessary to deliver the best possible care. And I have always believed that patients should be informed and involved in their care,” he explained.